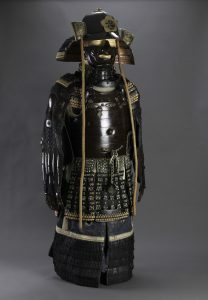 The Japanese tourist visiting the Topkapı Palace may be struck by the presence of sixteenth century samurai armor and helmet, normally displayed there permanently. It was presented, along with a sword, to the Ottoman Sultan Abdulhamid II in 1892 by Yamada Torajirō (1866-1957), an important pioneer in the history of Turkish-Japanese relations. Enamored with the everyday life and beauties of İstanbul, Torajirō who was to remain in the imperial capital for almost twenty years, was witness to the history of the Hamidian era of autocratic conservatism and the subsequent dramatic transition to constitutionalism that came with the Young Turk revolution of 1908. He was one of only two permanent Japanese residents in the city possibly in the whole empire for some time in this period. 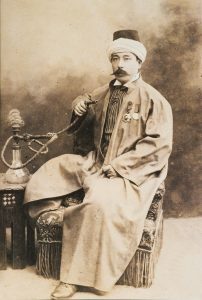 The other was Nakamura Kenjirō, the owner of the first Japanese store in İstanbul, Nakamura Shoten, a musée commercial which displayed samples of Japanese export goods and conducted trade between the Ottoman world and Japan and at the same time served as the meeting ground for communication between the Japanese and the Turkish authorities as a kind of unofficial Consulate. A retired Naval officer, Nakamura was Torajirō`s friend and business partner. The Director of Nakamura Shoten, the predecessor of the well-known “Japanese Toy Shop” of the early Republican İstanbul, for close to two decades until the eve of World War I when he had to go back to Japan, Yamada Torajirō`s impressions of the Ottoman world constitute the first detailed account of İstanbul from a perspective which was both Japanese and “Western”. His written works on Ottoman Turkey provide one of the first eye-witness reports by a contemporary Japanese of the world of Islam as observed through the Turks and their multi-religious, multi-ethnic empire. 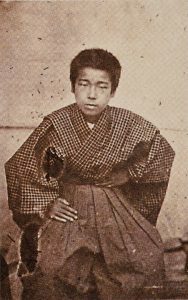 Yamada was typical of the first generation of Meiji elite whose education included a considerable Western element along with immersion in the Chinese and Japanese classics. Born into a high-ranking samurai family of Numata Han (Numata Beyligi), present-day Gumma Prefecture, as the second son of Nakamura Yūzaemon (Kanji) in the residence of the Daimyō (domain lord) Toki in the Toranomon district in the center of Edo city near the Shogun`s castle. Today`s Tokyo, Edo with a population close to a million was the seat of the Tokugawa Shogunate government Bakufu and the center of sophisticated urbane culture. Torajirō grew up in Edo (Tokyo) and Numata. Yamada Torajirō`s Ottoman career was launched by the famous Ertuğrul naval disaster of 1890. Abdulhamid II had sent the imperial frigate Ertuğrul to Japan under the command of Osman Pasha to initiate good relations with the rising star of the East. The frigate crew of 656 members under the command of Osman Pasha, made a long journey crossing the Red Sea Suez Canal, into the Indian Ocean and sailing across the Pacific, visiting many Asian port cities such as Bombay, Colombo/Ceylon, Singapore, Saigon and Hong Kong where the Turkish officers and crew formed good public relations with local Muslim communities. On July 17, 1890 after an arduous journey of 11 months, the Ertuğrul arrived in Japan. After a successful visit in Tokyo during the summer, on September 15, Monday, the Ertuğrul embarked on its long journey back to İstanbul. The next day, on September 16, the weather conditions however started to quickly deteriorate and the ship soon found itself battling a typhoon. One of the masts collapsed, water broke through into the coal depots and the ship set course for Kobe, the nearest safe harbor. The crew battled the storm valiantly, but it was all for naught. Around midnight on September 18, Thursday, the Ertuğrul hit the sharp rocks on the coast of Oshima Island. Only sixty-three sailors and six officers managed to save themselves. Some 533 crew members, including Ali Osman Pasha, lost their lives. The villagers of Higashi mura and the Japanese authorities exerted great effort to take care of the survivors. Under great difficulties, the local Japanese villagers collected the remains of the deceased and conducted a solemn funeral rite for their spirit. Torajirō was initiated into action with the beginning of nation-wide movement in Japan for the collection of donations to help the bereaved Ertuğrul families under leadership of Japanese newspapers Osaka Asahi shimbun, Tokyo Nichi Nichi shimbun, and Kobe Yūshin Nippō, and the Jiji Shinpō which also competed in publicizing news about the Ertuğrul disaster and its aftermath. Torajirō explains to us in his biography Shingetsu published in 1957 that he consulted with Foreign Minister Aoki Shūzō about taking the donations to Turkey who advised that he personally take the sum to Turkey. On 1892. Meiji 25. January 30, Torajirō departed from Yokohama bay with the donation money on the British ship Pasan chartered to pick up the battle ship Matsujima being constructed in Lyon, France for the Japanese Navy. During this period, Torajirō formed partnership with Nakamura Kenjirō, a retired Naval officer from an Osaka family in clothing and textiles business. Both were interested in opening trade with Turkey. 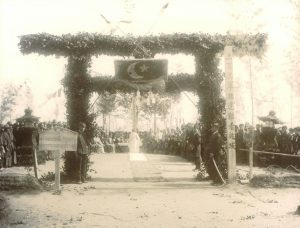 On 1892, Meiji 25 April 4, Torajirō arrived in İstanbul. He met with Foreign MinisterSait Pasha and turned over the donation sum. Presenting the gifts of Nakamura family heirloom samurai armor, helmet, and sword to Sultan Abdulhamid II. 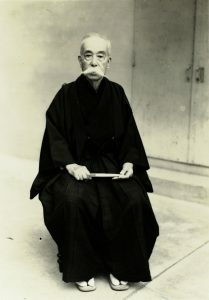 Through the assistance of Noda Shotarō, Torajirō also took over the duty of teaching Japanese to military cadets after the return of journalist Noda Shotarō to Japan. Torajirō returned back to Japan briefly with the battleship Matsujima, and on 1893, Meiji 26. In April 16, upon the suggestion of the Foreign Minister Enomoto Takeaki, Torajirō gave a lecture in the Seminar of the Japanese Colonial association (Shokuminkyōkai) on conditions in Turkey and Egypt which reflects the new interest in Japan in expanding trade with the region. 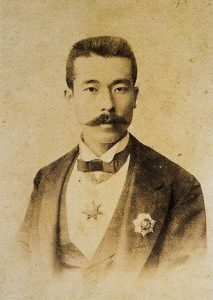 During the summer of 1893, Torajirō departed from Kobe, and came back to İstanbul to set up Nakamura Shoten Store with Nakamura Kenjirō. Most important, the Ottoman government clearly chose to allow Torajirō and Nakamura to start their business in İstanbul. Despite the fact that Japanese subjects had no legal treaty status in the city, they were able to smoothly function as if they did, which is reflective of the “twilight diplomacy” mode in Japanese-Turkish relations in recent decades. Torajirō formed good relations with the Ottoman Chamber of Commerce (İstanbul Ticaret Odası) to function as a musée commercial, having obtained the Ottoman law that was promulgated in 1890 on musée commercial regulations. He also became a good friend of Spirakis Alexandritis, the Secretary General of the Chamber and the editor of the Annuaire Oriental Bulletinwith whom he continued to communicate even after returning back to Japan decades later. Torajirō got permission to display Japanese goods such as silk, porcelain, tea, wooden objects in one room of the Chamber before renting space along Pera street to set up Nakamura Shoten. Between 1895 and 1899, Torajirō published numerous articles on Turkey, Toruko,including an interesting piece on Turkish theater in Taiyō (The Sun) magazine. In Toruko Gakan, he also translated plays performed in İstanbul during the late night performances in the Ramadan month including a play on Dağlı Kız (Mountaineer Girl), the story of a beautiful daughter of a mountain bandit who saves innocent victims of a kidnapping, and Kıskançlık (Jealousy), a romantic comedy. During this time Torajirō published articles on “The Real Circumstances of Turkey and Egypt” in The Japanese Commercial Magazine (Nihon shōgyō zasshi), “Women of Turkey” in The Sun, 1895, “News from Turkey” in The Sun, 1896, “Conditions of Turkey” in The Sun, 1899. Not all his articles were on culture. Torajirō also reports on the 1896 Ottoman Bank Take-over by Armenian terrorists to Taiyō magazine. Nakamura Shoten becomes a central venue for Japanese visiting İstanbul. The store opened first in Hazzopulo Passage in Pera, and later moved to better location in Cite de Pera (Çiçek Pasajı). The Sultan and members of the Ottoman dynasty who were enthusiastic about Japanese manufactured goods, household artifacts and decorative items become major customers. Buying Japanese goods became popular in İstanbul, partly because of the fashion for Japonais which arrived from Europe, but partly also because of the Ottoman public’s mood of admiration for Japan. Present day collections in Dolmabahçe and other palaces of İstanbul are full of articles bought from Nakamura Shoten, including the porcelain vase that is on display in this exhibition. This is an extract from Selçuk Esenbel’s article in the exhibition catalogue for The Crescent and the Sun: Three Japanese in Istanbul.